Floral craft bird nests are a great way to add a touch of nature to your décor. They can be used in many ways, from flower arrangements and wreaths to shadow boxes and Christmas tree ornaments. Once you get in the habit of working with these accessories, you will find many ways to use them in your creative time. 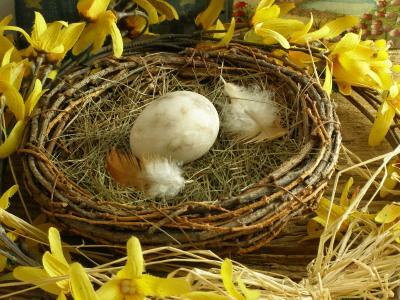 What Are Floral Craft Bird Nests? They are nests of various sizes created from materials like straw, raffia, Spanish moss, and other natural materials. The craft nests are quite sturdy and you can handle them as much as you need to in order to get them into the correct position on your project. These nests can be hot glued or wired in place depending on what you are making. This makes them very versatile. Hot glue will work best for floral arrangements and centerpieces. For wreaths and other projects that hang, wiring the nest in place will be the most secure. There are many more possibilities. The ways to use these floral craft bird nests are limited only by your imagination. Use them as containers to present small gift soaps. Wrap each one in tulle and tie with a wire ribbon. You can also use cellophane and silk ribbon for a more sophisticated look. Use them as a container to hold chocolate truffles, Jordan Almonds, or jelly beans. Wrap them in tulle as above. If you are using the nests as party favors, you may want to place one at each table setting or place them en masse on a side table for your guests to pick up as they leave. They can be piled in a basket or hung from a tree branch that you have secured in a Plaster of Paris base. This Grapevine wreath bird nest is a cottage style addition to your home. You can change the flowers and other items you place on the wreath for different seasons. Holiday bird's nest is a great accent for the winter holidays. Wedding ring pillows would be great for a garden wedding! Most local craft stores carry the nests in a variety of sizes and materials. Try to match the nest to the craft that you will be using it for. Using a very natural Spanish moss nest will not work well if you are doing a very sophisticated party favor, for example.Most of the nests can be painted if you desire. Use a good spray paint and follow the directions carefully. Always use spray paints in a well ventilated area. Depending on the amount of coverage you want on the nest, you will need to use one to three coats of paint. One thin coat will allow some of the natural material to show through and give a more rustic look, while three coats will cover completely and be better for an elegant look. Bird nests will always add a welcoming country feel wherever they are placed. Put one on top of a stack of antique books, in a glass cabinet, or tucked away on a shelf. Add a nest to your next craft project to help it say "Welcome Home".